September | 2012 | what? bread? is the title of a cookery book I own. It contains ‘Ideas and Recipes from Stones Restaurant in Avebury’. Stones Restaurant in Avebury went the way of many good things some time ago. It was a vegetarian restaurant run by two (disillusioned – their word not mine) archaeologists, Hilary Howard and Michael Pitts. It opened in 1984, and closed in 2000. Between 1984 and 1987 I was a student at King Alfred’s College, Winchester (now apparently the University of Winchester) and I studied History with Associated Archaeology. We spent a lot of weekends out and about in the college’s old red minibus looking at archaeological sites, and sometimes ended up at Avebury, either in the restaurant or the Red Lion. The recipe book was first published in 1989, the version I have comes from slightly later as there’s an introduction from 1991. Michael (Mike) Pitts has turned up on TV talking about excavations and other archaeological investigations in the Avebury/Stonehenge area in more recent times, and he has a blog over here http://mikepitts.wordpress.com/about/. And seems to be pretty busy. So perhaps he’s not disillusioned about archaeology any more. The recipes are probably what you’d expect from a veggie restaurant of that era, good solid pastry, robust soups and veggie versions of favourites such as shepherds pie, lasagne, koulibiaca, and many recipes they developed themselves, some salads and some cakes. All good stuff to eat after a hearty walk to West Kennet Long Barrow or around the henge and along the Avenue at Avebury. None of that new fangled ‘fusion’ cooking and from a time before Heston Blumenthal was let loose in an apron. They also recommended using locally sourced ingredients long before it became fashionable and the book mentions lots of cheeses, ciders, beers and things that were local to the area. You can get second hand copies on Amazon I see. The recipe I’ve cooked most frequently is for carrot cake. I don’t remember if I ever ate it at the restaurant, but I can’t count the number of times I’ve baked it for work for fundraising affairs and for friends. I’ve made it so many times that I think people think I can’t make other things, and this blog is a result of a desire to record that I can bake other things. 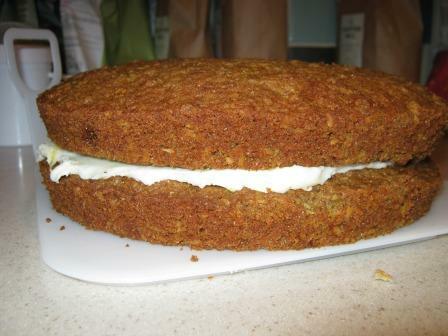 So tomorrow, for McMillan Coffee Morning we’re having a Carrot Cake-athon. I’m doing mine and a colleague is doing two of hers, including the latest Hairy Bikers light-weight one. I will also be buying some from a local deli – which declares it has the “best carrot cake I’ve ever tasted” in the view of one of their customers and we’ll be doing a comparison. Carrot Cake from Stones Restaurant – recipe reproduced with permission from Mike Pitts because the book is out of print now. You can mix it all up nicely, in stages and carefully like, – dry goods first, then in another bowl the oil and sugar, then the eggs one at a time, then add the flour and lastly stir in the carrot. But I favour just weighing it all out into a big bowl and giving and big stir up. The recipe says to bake it in one tin and then split it into two parts, I’ve never had the nerve for this because I know I’ll get it wonky so I bake it in two lined 8 inch sandwich tins at 160 C on fan setting for about 40 to 45 minutes. To fill it the book recommends cream cheese, but I usually use a bit of lemony butter cream made with the juice and zest of a lemon, some icing sugar and a dollop of soft butter, thrashed together in a bowl. The recipe is enormously tolerant of mixing in different kinds of flour and sugar and playing about with the amount and type of oil and spices. In fact, I have shared this recipe with lots of people, and oddly, it always comes out differently when they make it. One used olive oil, another used green coriander where I’ve always assumed it means ground coriander, perhaps I’m wrong. Anyway, they’ve all been very happy with the results, so I recommend this to you, along with a trip to Avebury in the autumn or winter. Here’s the picture and there’s no top view because I’m somewhat unhappy that the top bit split – which happened when I picked up one bit and moved it into position – it’s never done that before. As this is for work where we don’t stand on ceremony and use cutlery I won’t hide it with more icing, but I would have done for more refined company. [Edit] Result of the cake-off was the winner was Costco! Shakes head in despair. The statistician says it’s not significant and all the entries were yummy. At the end of the summer holidays the boy and I visited the Bethnal Green Museum of Childhood run by the Victoria and Albert Museum. The boy was 10 years old last Thursday and is nearly too old for this sort of place, but for now he still enjoys seeing old toys and playing with the piles of Lego in the museum. We were supposed to be thinking about Victorian children for his holiday homework, but that didn’t take too long. On the day we were there we could watch the Suitcase Circus for free. They did a half-hour show, which was enough for most of the small people there. I think the ‘frog being sick’ will stick in everyone’s memory for a long time to come. You can watch a clip of the show for yourself on YouTube . We got to Bethnal Green on the tube, but decided to go back to the Euston Road by bus. The bus we hopped on went past Brick Lane so we jumped off and visited the 24 Hour Beigel Bake shop. As it was just after lunchtime and I’d already schoffed my sandwiches I didn’t have one of the hot beef beigels, although they smelled fantastic and I will remember that for next time. I spent 30p on a buttered beigel for the boy and bought 4 plain beigels to take home. The boy of course scoffed his up and declared it delicious, and only 2 of the other beigels made the train journey home. 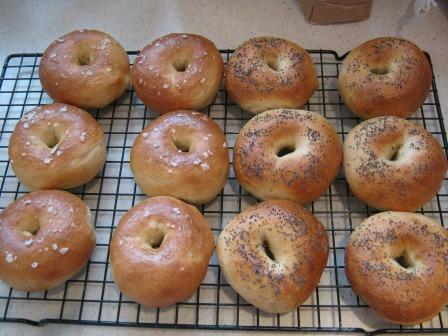 So, this morning, as we have a family party this afternoon I have made a batch of beigels. I mostly used Dan Lepard’s recipe from Short and Sweet, and checked it against the River Cottage Handbook No. 3. Dan has flour, yeast, salt, caster sugar, water, white wine vinegar. River Cottage doesn’t have the vinegar so I left that out, and also didn’t use the eggy wash that they suggested. I did use the brown sugar in the boiling water that Dan has included in his recipe. And I made 12, not the 10 that Dan suggests, as it’s for a party. If they were full sized they’d be more like those in bags in the shops, but as they are they are similar size to the Brick Lane ones. I wish I’d had time to take more photos as I made them as they looked a bit ugly when they were boiled, but they puffed up a bit and look fine now. The only problem is I don’t think they’ll last until tea time!